During a production of Calendar Girls, for which I had photographed and designed a calendar for the massively talented Little Theatre Company, I could be found backstage with a hook in hand. My husband is the technical manager of the theatre, and sitting at home alone seemed silly when the best gossip happens in the dressing rooms during show weeks! Taking advantage of the moments when most of the cast was on stage, I was able to create a number of fun projects, up to and including crochet naked ladies. What can I say? I was inspired! 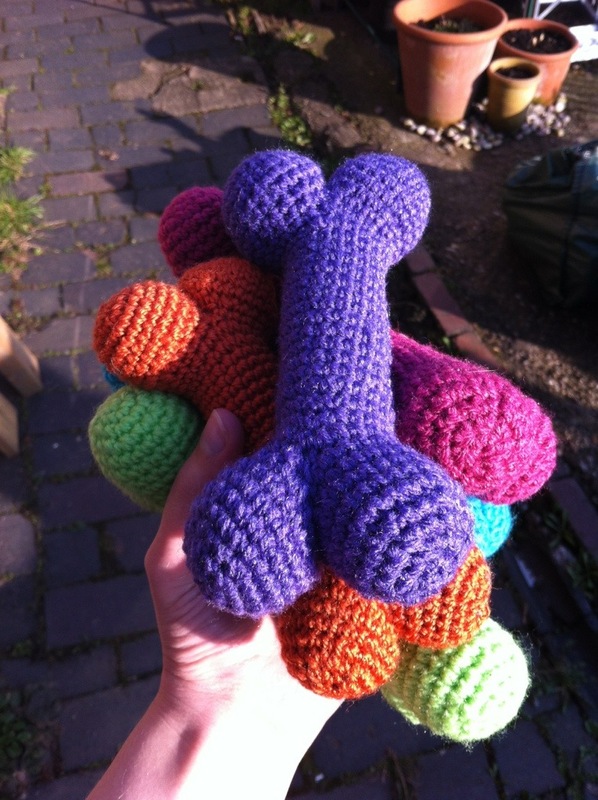 The one I’m sharing here is a quick pet toy for one of the cast who was organising a craft sale to raise money for Nowzad dogs. I cannot stress enough how utterly wonderful this charity is, please please do check out their website. The only issue I had whilst working this pattern…it does tend to look very rude until you’ve added the last sections. Cue much amusement from surrounding onlookers. A conversation starter if ever you need one! 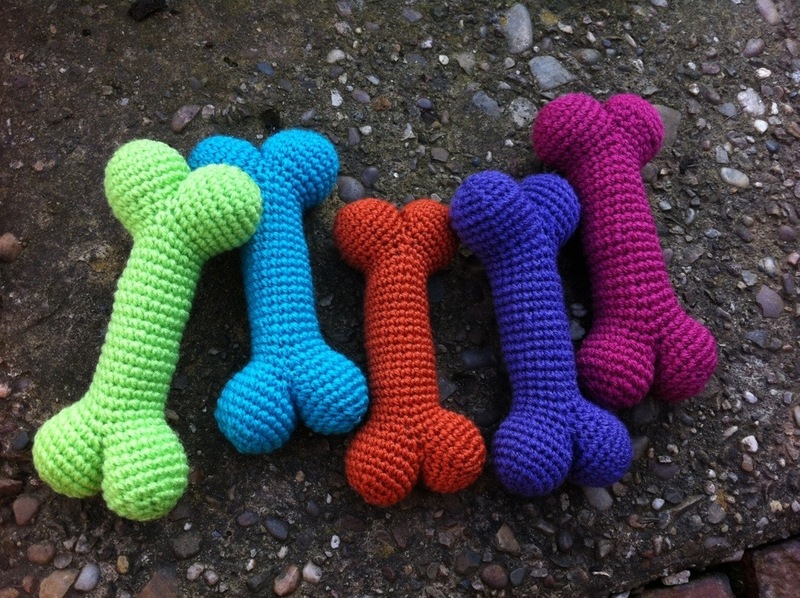 I created a generous handful of these dog chew toys really quickly, and recommend you are brave with your colour choices and even have a bash at trying out some colour work once you’ve got the hang of the pattern. These look fabulous the wackier the colour choices you try! Get in touch with your finished projects, I’d love to hear from you! Holding the two sections side by side so you can see an ‘8’ shape, with the first piece above the one you have just finished. The yarn end will be on the right hand side of the middle of the ‘8’ shape. Join the two sections in the middle of the ‘8’ shape by dc through 1 st on each side 6 times. You’ll now be at the left hand side of the middle of the ‘8’ shape. Stuff the end pieces at this point. To combat the natural twist of the crochet, dc an extra 2 st. Consider this point the new start of the next Rnd. Dc 6 st, chain 6. miss out 12 st, work a dc into 13th st. This is where the piece splits into 2 sections for the end of the bone. Your next st is now considered beginning of next Rnd. Break yarn, using a yarn needle sew through 6 st, pull tight. To finish, weave in all loose ends. So there we have it, this is a really fun project and I’m currently playing with loads of bonkers colour choices and embroidered patterns. I look forward to seeing your bones. Ah hem. 27 Jan	This entry was published on January 27, 2014 at 9:32 pm. It’s filed under crochet, pattern, toy and tagged bone, craft, crochet, crochet pattern, crochet toy, dog toy, handmade gift, pattern, Toy. Bookmark the permalink. Follow any comments here with the RSS feed for this post. Hello, I’ve started my first bone. I am stuck at the point where you join the two cups together. “Join the two sections in the middle of the ‘8’ shape by dc through 1 st on each side 6 times.” Does these mean I should have a total 6 dc once the two pieces are joined? After joining with 6dc what is St 6? “St 6 (so we’re at the top of the ‘8’ shape), we’ll consider this the beginning of the following Rnds. (24)” And once I’ve done the stitches correctly I should have 24 loops or stitches on each cup, is this correct? Thank you, any advice you can give me would be great! I don’t why I’m just not getting this to work. I’m going to give this another try. Maybe something in my brain will click and I will get past that stuck point. Wish me luck! Sorry you find it confusing, this was a very early pattern for me. Hope you managed to get it sorted!